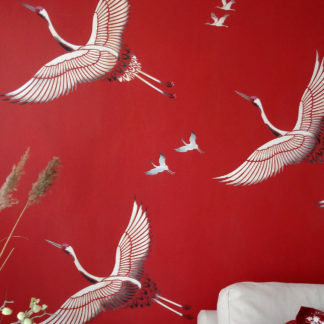 Chinoiserie Wall Stencils 1 & 2 – two beautiful large stencil panels based on classic 18th century hand painted silks and wallpapers – depicting trees, full blown roses, blossom sprays, exotic birds and bugs – ideal for impressive full length stencil drops and handmade wallpaper effects and exquisite fabric printing. See specifications below. 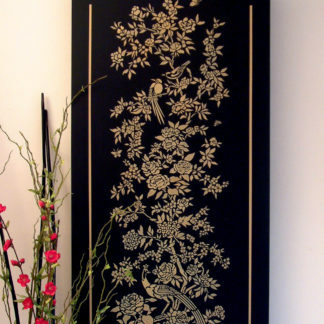 Chinoiserie Wall Stencils 1 & 2 – We have noticed lots of customers purchasing both Chinoiserie Stencil 1 and 2 together as a pair, as chinoiserie decoration has become more popular. 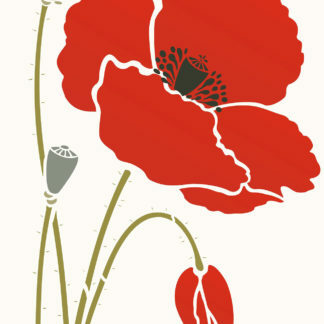 So we’re offering these stencils as a pair at a discounted price. 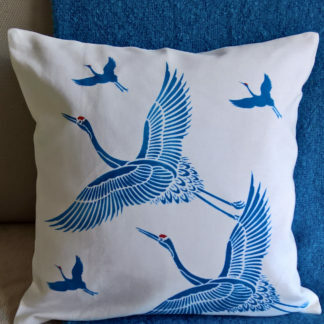 Above top – Beautiful on turquoise raw silk panels, Chinoiserie Stencils 1 and 2 are perfect stencilled in Motif Fabric Paints (see right below for colour details). 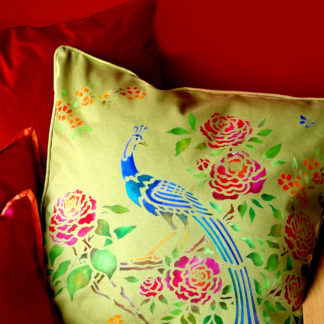 Above- the Chinoiserie Stencils look stunning on an emerald green background, perfect for statement decorating. 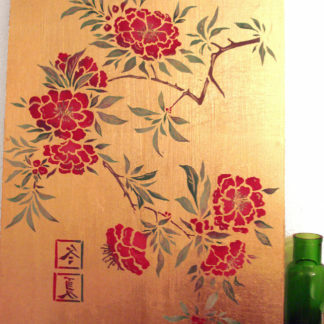 See Chinoiserie Stencil 1 and Chinoiserie Stencil 2 for further information on these stencils and to purchase individually. 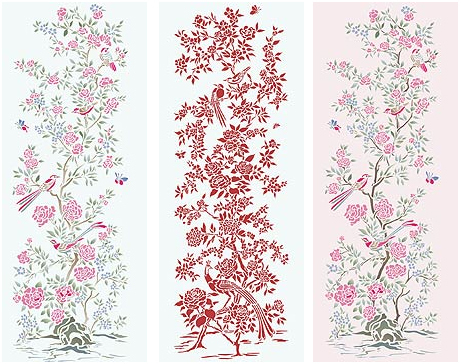 Above – Chinoiserie Stencil 1 (left and right) and 2 (middle) – in single and multi colour applications. 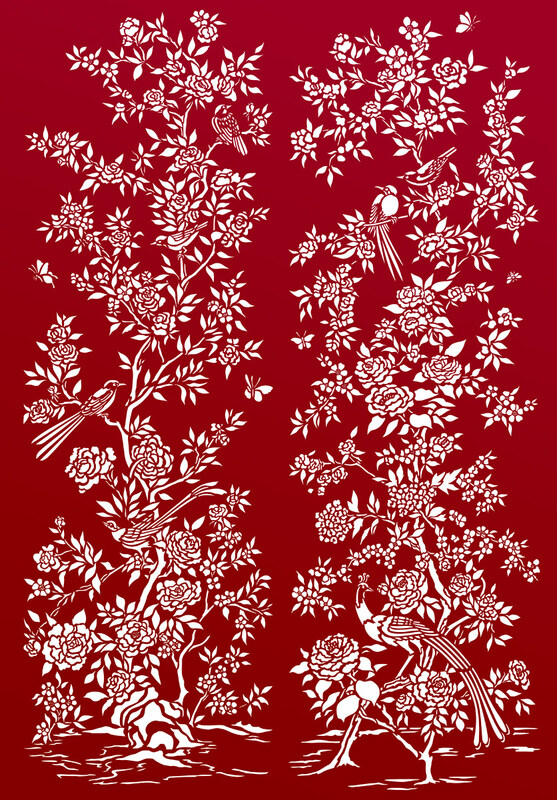 Above – Chinoiserie Stencils 1 & 2 on a deep red background in simple Ice White Stencil Paint. 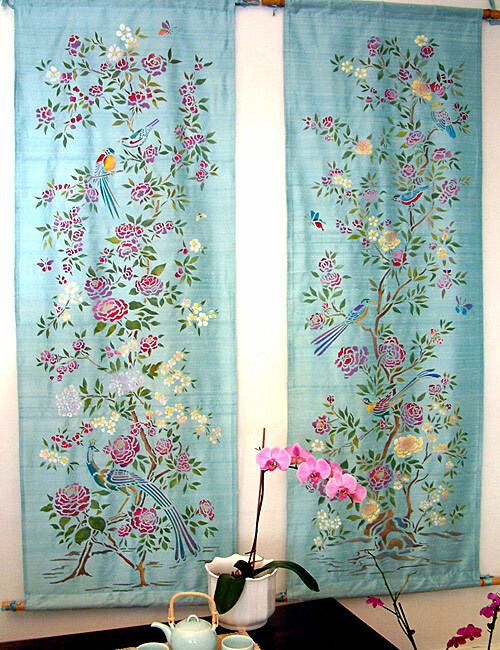 Above – Chinoiserie 1 (right) and 2 (left) stencilled onto turquoise raw silk panels in Magenta Pink, Strawberry Red, Taupe, Leaf Green, Light Lime, Sunny Yellow, Cobalt Blue, Bright Purple and Pure White Fabric Paints. 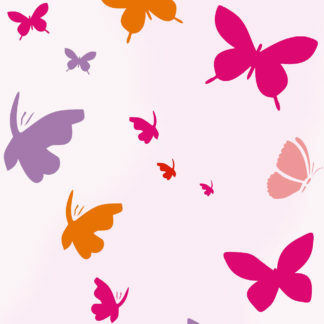 These one layer stencils both come in two sections with easy to use alignment dots for registration that align vertically to create a complete panel. 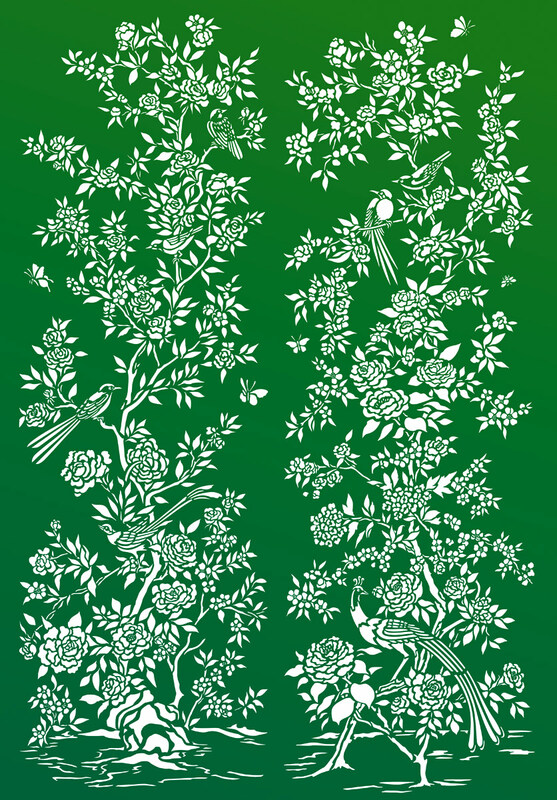 Both stencils comprise 2 large sheets, so this is a 4 large sheet stencil pack. 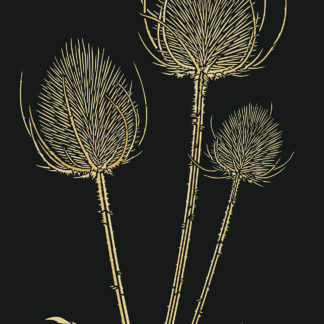 The top section, as shown top left, is up to approximately 82cm (32″) high. 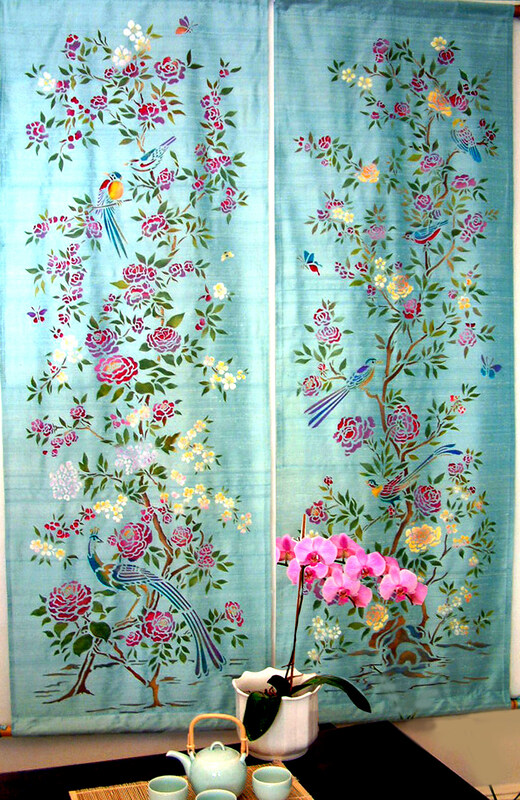 The bottom section, as shown bottom left, is up to approximately 85cm (33.5″) high. The height of the complete panel is also up to approximately 167cm (66″) by approximately 53cm (21″) wide.